Guitarist/saxophonist/vocalist/arranger Matt Catingub formed Big Kahuna and the Copa Cat Pack in his home state of Hawaii, blending its indigenous sounds with stylish, party-ready retro-swing. 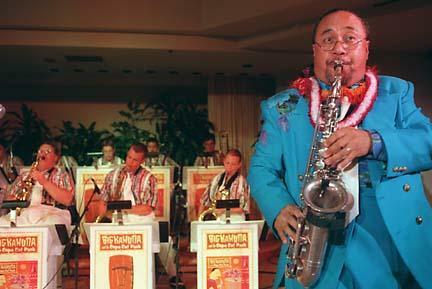 The group issued its debut album, Hawaiian Swing, in 1999. Shake Those Hula Hips appeared two years later. Bustling with energy, big-time swing, and a tight, top-notch musicianship so rarely heard in most of today’s swing bands, Big Kahuna & the Copa Cat Pack’s Hawaiian Swing delivers a unique and an irresistibly danceable brand of swing. Members of the group include Matt Catingub – "Big Kahuna," arranger, vocals, alto sax, piano The Copa Cat Pack is: Chris Pearson – alto sax Chad Hollingsworth – alto sax David Wells – tenor sax Jennifer Lovejoy – baritone sax Dave Scott – lead trumpet Jason Ravina – trumpet Mike Olmos – trumpet Doug Beavers – trombone David Blacker – trombone Dan Parenti – rhythm bass Steve Moretti – drums Linda Harmon – vocals.